When Adobe announced it was discontinuing its mobile Photoshop Touch app earlier this year, it hinted at greater things to come in a mysterious project code-named "Project Rigel." While it listed a vague "late 2015" availability at the time, a recent CNET report suggests we'll be formally introduced to Adobe's new offering this October. The company's latest pro-level mobile effort will reportedly come in the form of a free iOS editing app that looks to offer much of the desktop software's capability wrapped in a touch-friendly UI that won't scare away novices. There still aren't many details, but CNET says the app is expected to make its official debut at Adobe's Max conference in October. We can expect desktop tools that professionals are used to combined with menus and tools designed to be precisely controlled with a fingertip rather than a more accurate mouse pointer or stylus. Of course, Project Rigel isn't Adobe's first entry built for smartphones and tablets. Previous efforts include the discontinued Photoshop Touch and the more consumer-oriented Photoshop Express (pictured above). 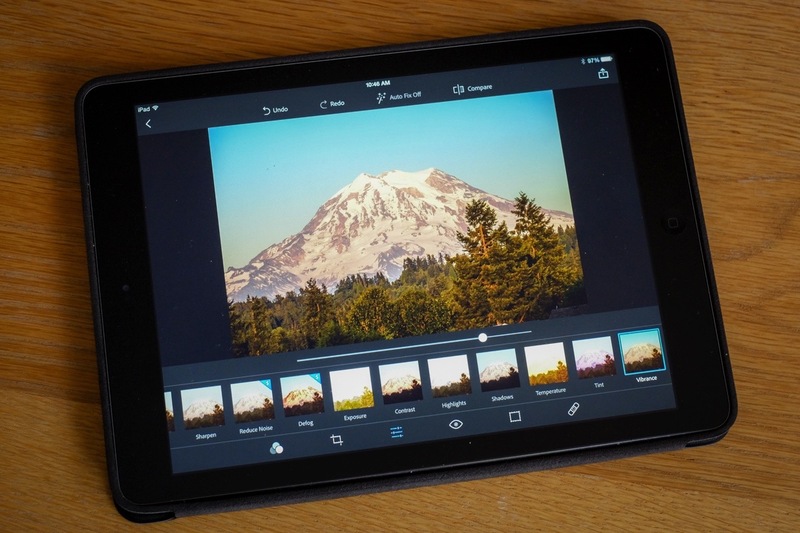 It also offers Lightroom for mobile, but the app (available on iOS and Android) feels more like a powerful companion to its desktop sibling rather than a standalone option for mobile photogs. Project Rigel could represent the company's strongest push yet to make an impact in the mobile market, but it looks like we'll have to wait a little longer to find out.